What a thrill to have my books noted by a best-selling author of historical fiction! I met Sharon last year at the Historical Novel Society Conference in Denver. She is so generous with her time, with her fans and with authors like me. And she writes amazing books – I have many on my TBR list, but will recommend Here Be Dragons as my favorite. 13th century, King John, England, Wales, and France – fabulous! Men of the Cross and For King and Country (Battle Scars I & II) take place at the end of 12th century while John’s brother, Richard the Lionheart, is king. John’s shenanigans are the focus of Book II. Fans of Sharon’s Lionheart and King’s Ransom will enjoy the series (even if I do say so myself). I hope you’ll check them out! And don’t forget, both books have been recognized as great reads. Men of the Cross was awarded the B.R.A.G Medallion in 2014; and For King and Country has been long listed for the Historical Novel Society Indie Award for 2017! 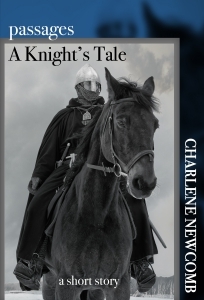 Charlene Newcomb is the author of the Battle Scars series, 12th century historical adventures set during the reign of Richard the Lionheart. There will be more to come, so sign up for Char’s Mailing List. It will be used – sparingly – to offer exclusive content and to let you be the first to know about special offers. On a professor’s recommendation, I picked up Penman’s *When Christ and His Saints Slept* (about the war between King Stephen I and Empress Matilda). It’s definitely worth a look: thorough history and engaging story. And to be recommended by Penman herself–that’s awesome. Congrats! I have When Christ and His Saints Slept on my bookshelf – unread so far, but one I definitely plan to get to eventually. Though it’s a later period, The Sunne in Splendor (about Richard III), is highly acclaimed too and on my TBR list. I’ve heard a lot of good things about *The Sunne in Splendor*, but I didn’t know it was about Richard III. (He happens to be both my favorite English monarch and my favorite literary villain.) I’ll have to look into it! How wonderful. You have big bragging rights now!